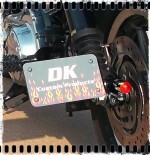 For Fender Mount on Sportster, Dyna, Softail, & M8 Softail Models. High & Tight Relocates your license plate to the Left side of your bike, right behind, and in line with the shock. Optional 22LR Billet LED Tail Light. 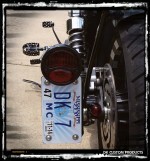 Curved Mount License Plate Relocation, with Optional 22LR LED Tail Light. 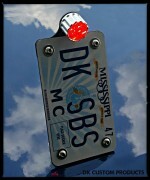 Relocates your license plate to the Left OR Right side of your bike & Includes a BRIGHT 22LR LED Run/Brake Tail Light. Relocates your license plate to the Left OR Right side of your bike. 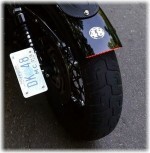 Curved Mount Relocates your license plate to the Left side of your bike. Primary Curved Mount Relocates your license plate to the Left side of your bike, right behind the Primary. High & Tight Relocates your license plate to the Left side of your bike, right behind, and in line with the shock.